Solved and survived the first CTS field test to come up with training zones. Iam reading a book that will turn around my training. To start with Iam talking in the following a bit about my first test for 2015. 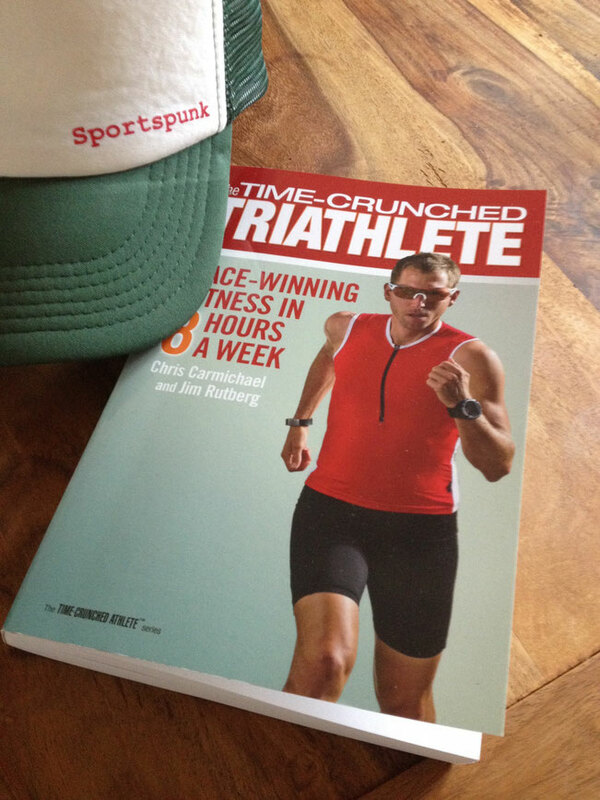 To begin with, let me tell you about the book: It is called "The time crunched triathlete" by Chris Carmichael. The author is no less than the important coach of U.S. Cycling and also the coach that brought Lance Armstrong to his seven Tour de France wins with his training schedules. But: Iam not a professional. Everything else: I have a day time job in the office plus a lovely wife. So I have to put my training behind. This means my training schedule compared to a professional is very limited. This is exactly where the "Timed crunched triathlete" enters. This book and the training scheme is designed especially for people like me: Very limited time resources, but ambitious goals in my amateur sports. My plans for this year are focussing on amateur cycling races and some triathlons, which are mostly sprint distances. So I have to manage even to pack two sports into my plan. But in the end it´s all because of fun. Naturally, I want to improve my training to reach higher goals and to improve my performance in these two disciplines. So, starting to read the book by Chris Carmichael, I have a strong feeling, that it will change my training. It focusses much more on shorter training units. But on the same time those are packed with more and higher intensif units. Intervals are an important factor in the training schemes for the time crunched triathlete. Yes, and to fill your training with intervals, it is essential to know your heart rate and power zones. Since I don´t have currently any chance to measure my watts with a crank or any other power meter, I concentrate on heart rate and other not so important meters like cadence and feeling. The only way to come up with your heart rate zones is via a field test. For this purpose I applied this weekend the CTS triathlon field test. This test is described in the book "The time crunched triathlete" and its name derives from the author´s coaching company: Carmichael Training System. So, this weekend I pushed hard into the pedals and moreover into my legs. The test consists of two 8 minute intervals on the bike with a third and last intervals of the same time running. 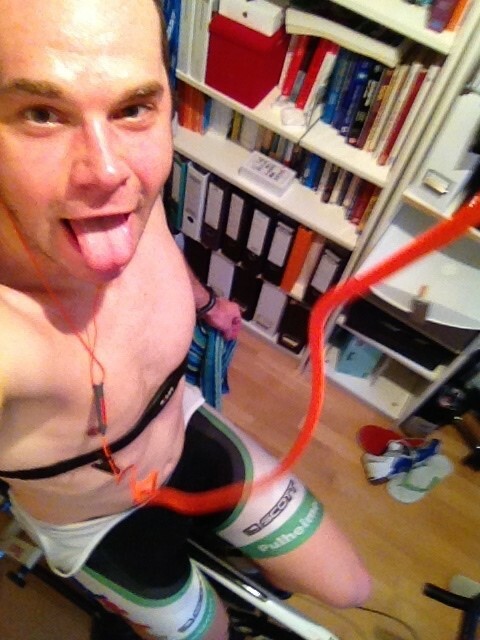 To better be able to manage a fast transition from bike to run, I did the cycling part on my hometrainer. I prefer to to field tests on real conditions outside. But there is limited time between the last bike interval and the run interval available. So you can say the field test was partly laboratoy and partly really field test. Anyway, Iam happy that I survived the test so early in the year. My values are also relatively good. At least this is what I think by just looking on it. You have to consider that this is my first test I have ever done on my own. Plus for many many years ago I did my last performance test anyway. These are the heart rates I attained during my first CTS field test in February 2015. So I believe I have a good fitness base to start into the season 2015. Of course, there is a long way to go to reach performance levels that allow me to compete. But I think that the training schedules by Chris Carmichael will enhance this year´s training. My low experience with this test can be seen in the difference between cycling effort 1 and 2: My heart rates in the second effort are higher than in the first one. Even though I warmed-up as described by Carmichael. Still the first effort hurt more than the second one. So next time I have to push harder in effort number one. But at that time I didn´t really know how long I will sustain with a too high heart rate. At least this I was what I feared: Not to give up to early because of pushing it too hard in the beginning. Now I know better for the next time. With the help of the result of the CTS field test I can figure out my training zones for different kinds of training and different kinds of intervals. Becuase as I said before my training this year will from now on focus more on intervals. To gain most competitive performance as possible in the lowest amount of time available. Some of my cycling buddies apply this techniques as well. To be honest I received the hint about this training from them. Iam very thankful for that that gave me these hints. They are very limited in training time as well. Probably even more. Nevertheless, their plans are to start on some cycling competitions as well and they say with the schedules from "The time crunched cyclist" (there is the same book as for triathletes focussing on cyclists on the market) it is possible. Iam looking forward to this year and I will let you take part in it via this blog. 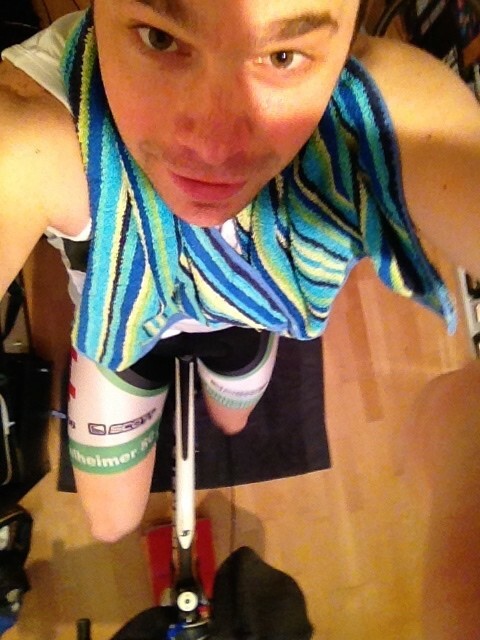 Let´s see how much my training will change in the end and my performance as well. So stay tuned. I will give you updates via articels, pictures on Instagram and videos on Youtube. Let me know in the comments below: Do you have a similar training schedule? What are your experiences?